The telltale sign that we are in a new age of automation isn’t in the latest food ordering apps, driverless taxis, or noodle-cooking robots. It’s in stagnant wages. Avent is the latest to weigh in on what has been dubbed the Digital Revolution, the Fourth Industrial Age, or the Second Machine Age, with his book “The Wealth of Humans,” published in September. These theories sketch out various Utopian to near-apocalyptic futures, but share significant themes about the present: Our economic mores are out of date; rising inequality and deteriorating employment conditions across the developed world are significantly driven by technology; automation could lead to high permanent levels of unemployment. Fears of a jobless future are not new. When the tractors rolled onto farms and the cotton mills first belched smoke, these fears surged, only to evaporate as industrialization wrought new jobs. Could it really be different this time? After all, we don’t see plunging employment levels, and predominant classical economic theories don’t accept that tech progress can drag employment down. Accepted economic wisdom has begun to be challenged by significant figures like former U.S. labor secretaries and the head of the World Economic Forum. Automation and digital tech haven’t yet reduced the number of jobs, they say, but have been undermining the jobs market, hollowing out the middle class, and shunting more and more money into fewer and fewer hands. It’s not simply people losing jobs to robots. If humanoid robots streamed down sidewalks every morning on their way to work, the changes would be easier to understand, says Avent. Instead we see new computer programs and apps, global supply chains, workplace reorganization, changing job roles, and, yes, more robots. Stagnant wages are the “smoking gun,” says Avent. For decades after the 1940s, the wages of factory workers, teachers, doctors, and financiers alike rose in tandem with economic productivity across the developed world. Then in the mid-70s, things started to unspool in the United States, with other countries experiencing the same changes over the next two decades. Average real wages stopped rising arm-in-arm with productivity, and in some countries flatlined for decades. The range of salaries split further and further apart—top incomes soared, the middle class shrank, and more money flowed to capital, finally arriving at today’s historic levels of inequality. The anomaly has been blamed on globalization, political changes, and problems inherent to capitalism. However, technology is an overlooked—and significant—factor. “It’s because of rapid technological change that we are seeing crummy conditions for workers,” said Avent. Developed economies are shifting away from permanent, full-time jobs towards temporary, casual, and part-time work. Accompanying that trend are stagnant wages and declining stability in all but the highest-paid jobs. The number of “zero hours” contracts in the U.K., for example, quadrupled in the last 10 years. Technologies such as Taskrabbit and Uber have enabled flexible earning opportunities (while exemplifying precarious employment), but these aren’t necessarily what is driving the shift. “Previous waves of tech progress have brought with them an almost inexhaustible thirst for labor at almost all skill and labor levels,” he said. He gives the example of assembly-line workers and payroll clerks in a factory now replaced by technology capable of performing routine work. “My fundamental conclusion is that those routine jobs are not coming back,” McAfee said. The possibility that we are in the middle of a new industrial revolution, facing potential mass technological unemployment—jobs lost due to technological change—has only entered mainstream debate in the last five years. Avent believes that long before we have transitioned through this revolution, we will have to negotiate high levels of unemployment and economic problems. We need to reconsider the fundamental truths of how labor markets work, Avent says. “Most economists are pretty resistant to the idea that technology will really take a lot of jobs,” he said. McAfee, however, says that most of the economists he talks to are willing to accept that we have entered a new technological era. When Martin Ford self-published his first book about technological unemployment in 2009, it hardly registered a blip, he says. Six years later, he won several awards from the financial press for his second book, “Rise of the Robots,” which outlines the threat of a jobless future in very stark terms. Ford says governments, especially in Europe, are also starting to take notice. Economists accept that technological unemployment can happen to an individual or group during a transition. However, permanent mass technological unemployment is rejected by prevailing theories and hasn’t been borne out by history. For example, robotics startup Momentum Machines is working on a robot that produces made-to-order burgers from raw ingredients, with the goal of obviating the need for human input. But the company claims their burger-bot will increase employment. The logic follows the classic argument: The company that makes the burger robots will hire more people, and restaurants will expand thanks to the reduced cost of hamburgers. Burger consumers will save money and spend it elsewhere, creating additional jobs. Some economists also argue that if technological unemployment existed, it would be revealed in two key statistics: a rising unemployment rate and soaring productivity. So far, neither is blatantly obvious over the long term. Ford believes that in the end we could see rising unemployment, but for now the impact is seen in what he dubs the “seven deadly trends”: stagnant real wages; the declining role of labor in generating national income (including GDP); the decline in labor force participation; long-term unemployment and declining job creation; soaring inequality; underemployment and declining incomes of recent college graduates; and job polarization (the loss of middle-class jobs) and the proliferation of part-time jobs. He doesn’t believe that technology alone causes these trends, but that it is a significant and overlooked factor. At the lower end of the market, as a growing pool of workers vies with the robots, wages are suppressed and bargaining power weakened, meaning companies don’t need to invest in technology to improve productivity. “They can just employ 10 cheap workers instead,” said Avent. But once economic conditions, investment, and development are ripe, automation can take over a given sector very quickly, says Ford, because efficiency gains will allow market capture. For example, once the burger-making machine is up and running—and cheaper than the workers—it could quickly be adopted across the fast-food industry, which accounts for 3 million jobs in the United States alone. Meanwhile, at the top of the job pool, even in fields such as financial analysis and radiography, humans are starting to vie with smarter and smarter technology. The Associated Press already uses automation technology to write stories on corporate earning reports. With half the rich world having a degree, educational achievement may be nearing a natural ceiling. “I think we’ve reached the point where it is much easier to improve machines’ performance than it is to improve the human performance,” said Avent. The competition between workers and machines has already wiped out many middle-class jobs and heightened inequality, shifting income to those owning intellectual property or stocks, says Klaus Schwab, head of the World Economic Forum, in an article for Foreign Affairs magazine. Digital technology has also heightened winner-takes-all scenarios. Amazon, Apple, Google, and Facebook have come to be known as the “Four Horsemen,” partially for their apocalyptic impact on entire sectors, like publishing and advertising. In the digital age, online shopping and price comparison can rank an entire global product market at the click of a button. Minute differences in pricing and features quickly allow one product or retailer, like Amazon, to capture much of the market. However, the impacts of automation will continue to grow, even without technological advances. Current technology could automate 45 percent of current workplace activity, according to a 2016 report by the McKinsey Global Institute. As McAfee and co-author Erik Brynjolfsson argue in “The Second Machine Age,” companies have yet to fully utilize current technology, just as it took decades to harness the transformative power of electricity. For example, initially, electric motors simply replaced the steam engines that powered a factory’s central shaft. It took years to realize the potential of multiple motors in different locations, allowing a reorganization of workflow that doubled productivity. 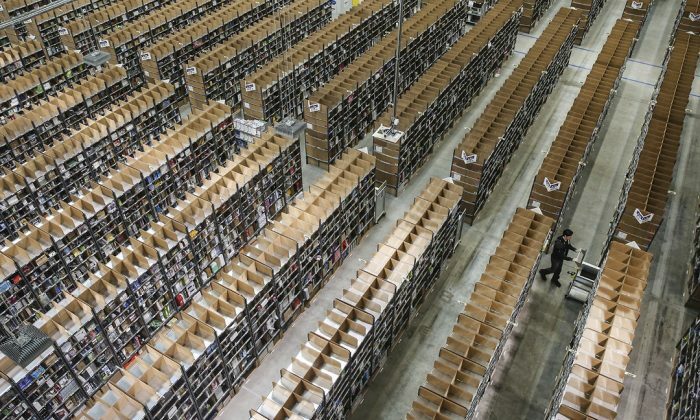 When Amazon upgraded its warehouse logistics in 2014, it did not replace human pickers with robots pushing trolleys and grabbing goods from streets of shelving. Instead, it created an army of automated trolleys that shunt mobile shelves around in a dance of algorithmic efficiency, bringing them to human pickers whose nimble fingers are still needed. While current technology is still underutilized, rapid advances continue. At the current pace of development, according to Moore’s law, computing will be about 200 times faster in just 15 years’ time. Despite having watched the progress of technology closely for years, both McAfee and Ford say it still takes them by surprise. “The mistake that I keep making is underestimating technological progress,” said McAfee. At the forefront of the new wave of developments is artificial intelligence (AI). Investment in AI will double every two years, predict analysts from Bank of America Merrill Lynch in a 2015 report. “The pace of disruptive technological innovation has gone from linear to parabolic in recent years,” the authors wrote. A handful of companies has already captured the AI market, snapping up the startups, says Ford. “In the past, AI was like a big science thing. It was something that happened in university, it was something that was funded by government,” he said. Now the likes of Google, Apple, Facebook, and Amazon regard it as central to their business plans and are throwing their full weight behind it. Fierce competition, as seen in Uber’s leapfrogging over Google to roll out the driverless taxi, will push development even faster, says Ford. “All of this is driven by the intersection of capital and technology,” he said. The sheer pace of development is accelerating market dynamics, work patterns, and changes in society beyond the pace at which individuals, society, or institutions can adjust. Those raising the alarm on technological unemployment and pointing to its impacts on the job market are not neo-Luddites instinctively cooking up a reason to knock technology. Ford is comfortable with all kinds of hair-raising sci-fi scenarios as he teases out how a world of increased automation might evolve, but says he isn’t trying to predict the future, just flagging the issues before it is too late to tackle them. He describes himself as a long-term optimist, but in the short term, he admits to being pessimistic. McAfee is emphatic about the overall positive impact of technological progress, something he refers to in his book as the “bounty” of the digital age. For him, the impacts on the job market and on inequality are only one feature of the Second Machine Age, but are nonetheless a genuine problem we need to tackle.